Hawara became especially important in the Roman period and seems to have functioned as the elite burial ground for people of the Fayum, an area between the main Nile Valley and the desert oases. 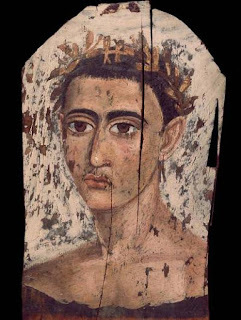 These painted panels are an important historical and artistic record. They illustrate the application of Greco-Roman art to Egyptian burial customs at the beginning of the first millennium. They appear to be naturalistic in style and be a portrait of an individual, while acting as part of the funerary equipment needed for entry into the afterlife. The panels would have covered the face of a mummy. The image of a young man on UC19610 dates to AD 140-160 – the style of the hair and beard indicates this period – and was nicknamed by Petrie the 'Red Youth' due to the reddish-brown skin tones of the sitter. Petrie often named the images of the panels he found and wrote short character sketches. The portrait panels have been cut out of their wrappings and are displayed here separately from the physical context in which they were found. When Petrie first exhibited these panels in London in 1889, he framed many like a European art work. This may affect how we look at these objects today. Not all panels were removed from their wrappings or mummies. The British Museum and Manchester Museum, for example, display mummies which still have these panels over their face.